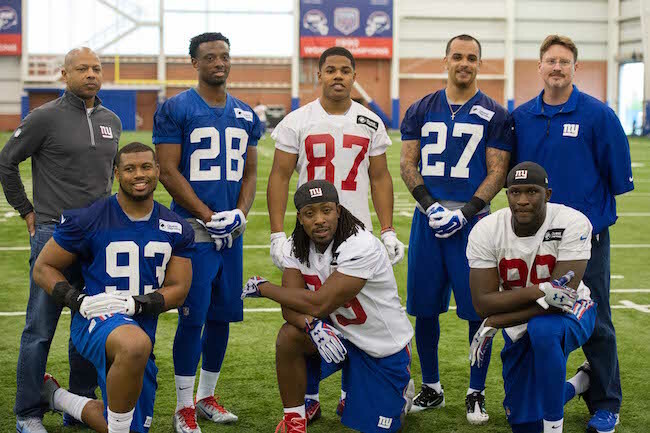 The first day of the New York Giants 2-day rookie mini-camp was held on Friday at Quest Diagnostics Training Center in East Rutherford, New Jersey. Seventy-four (74) players – draft picks, signed rookie free agents, first-year players who have not completed a season of credited service, and street and rookie free agent tryout players – were in attendance. A sights and sounds video of the players arriving on Thursday is available at Giants.com. Contrary to previous reports, wide receiver Michael Esiobu (Lakeland College) and linebacker Graham Stewart (Connecticut) were not signed. Both are present as tryout players. The only remaining draft picks unsigned are safety Darian Thompson (3rd round) and linebacker B.J. Goodson (4th round). The New York Giants have promoted Chris Watts from BLESTO scout, a role that he has served in for eight years, to scout. To replace Watts, the Giants have promoted Marquis Pendleton to the position. Pendleton had served as an intern in the team’s pro personnel department.